HTC has started rolling out Android 8.0 Oreo update for its U11 in Taiwan. The update was originally expected at the end of this year, but the Taiwanese company had evidently sped up the process, and has brought the latest software to its high-end smartphone that was launched with Android 7.1 Nougat back in May this year. The HTC U11’s Android Oreo update includes HTC’s Sense UI, few native improvements while most interface elements have remained largely unchanged. The smartphone has also received rotary menu, squircle icons, and notification dots. 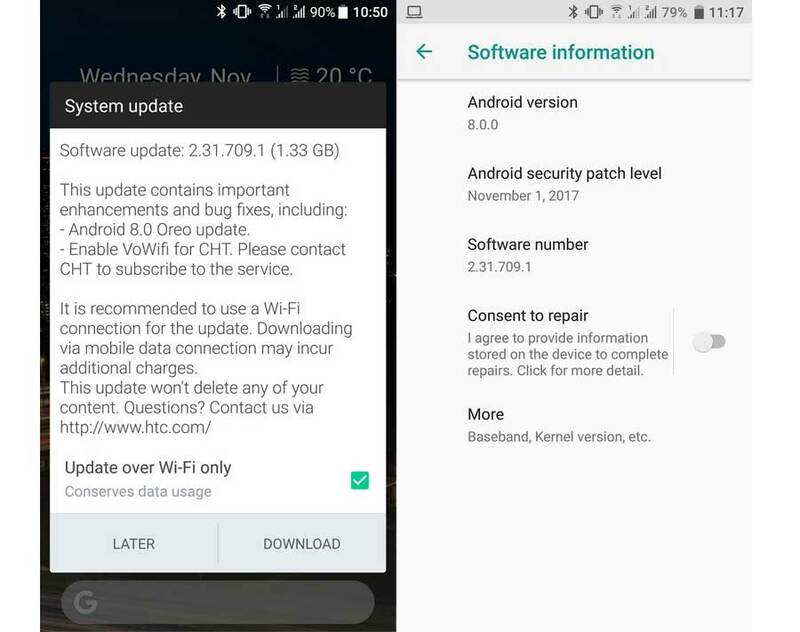 Besides, the update has build number 2.31709.1 and November 1, 2017 security patch. Just like any other firmware rollout, the Android 8.0 Oreo update for the HTC U11 has been released in a phased process. It would, therefore, take some time to reach for Global variant. HTC U11 will be available in the USA and UK market in Amazing Silver, Sapphire Blue, Brilliant Black, Ice White and Red Solar colors at a price of $649.99 / £499.99. As regards the technical specifications, the smartphone is equipped with a 5.5″ QHD display, Qualcomm Snapdragon 835 processor, 4GB of RAM, 64GB of internal storage and runs Android Nougat 7.1 operating system.